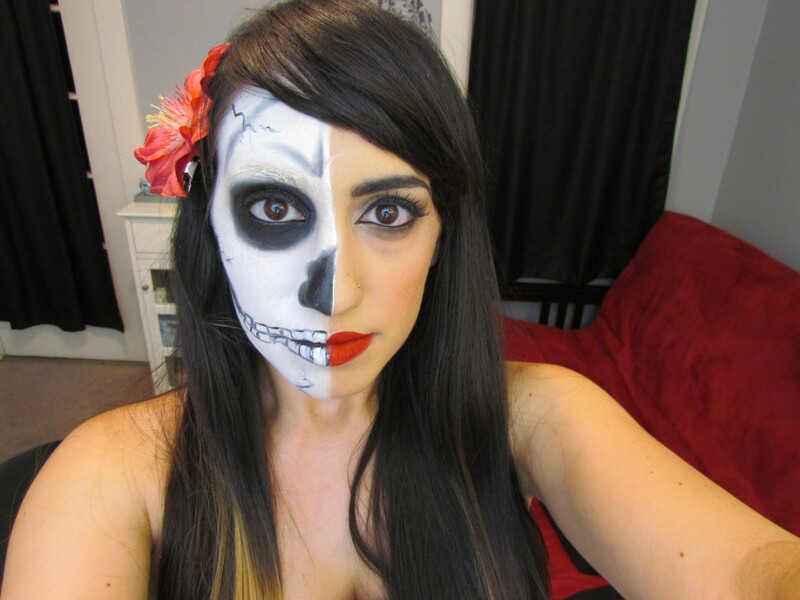 The past two weeks have been filled with lots of Halloween makeup and nail fun. 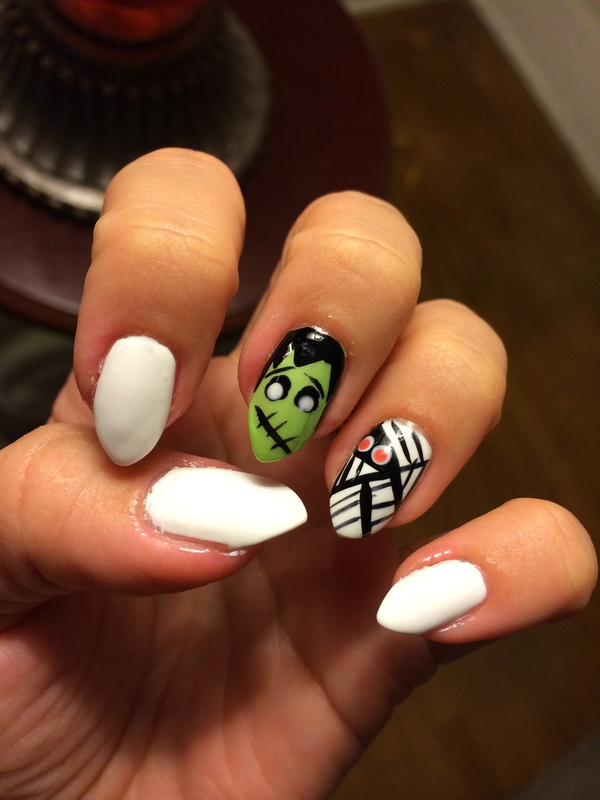 Today I wanted to share with you two of my Halloween-inspired nail ideas that I got from CutePolish. If you don’t follow her on Youtube you are missing out! I got a ton of compliments on this one. 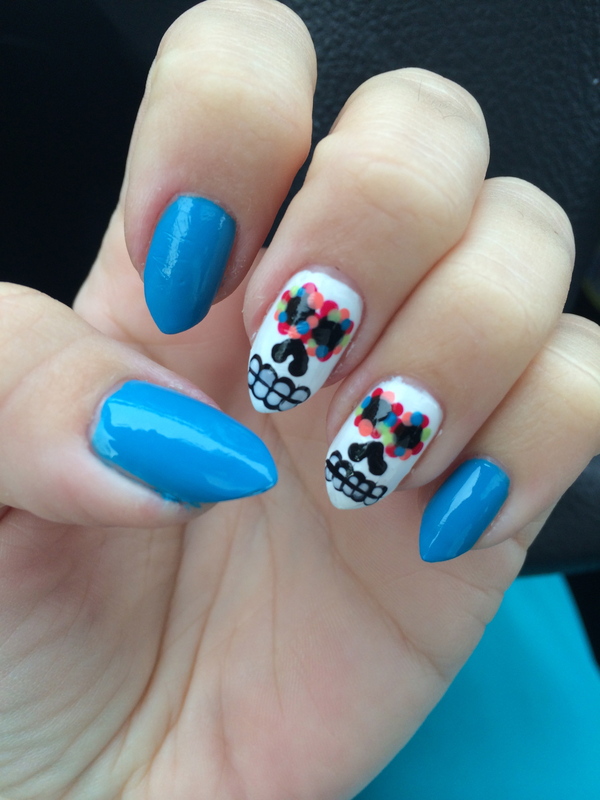 Paint three of your nails a bright blue (or any bright color you like!) Paint the middle two fingernails two solid coats of white. 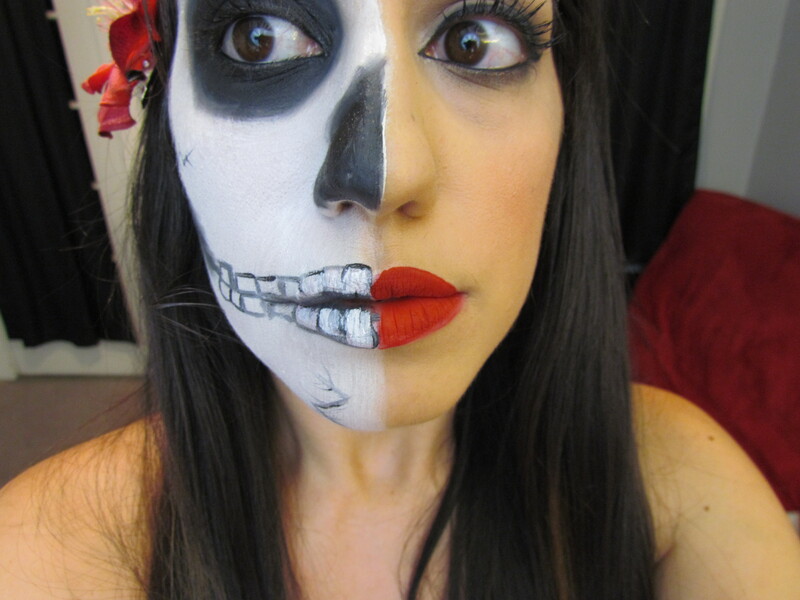 Create the eye sockets with a the end of a bobby pin and black polish. Pick 3-4 bright colors and apply them around the eye sockets with either a toothpick or a nail dotting tool (use the tiny end for these). For the nose, apply two dots of black then connect them with a black striper. For the teeth, create 8 big dots of black (four on top, four on bottom), then after it dries, add 8 smaller coats of white, leaving the edges of the black exposed. Finally draw a line between the teeth with a black striper. Done! Which one is your favorite? Let me know if you try any of these designs I’d love to see them! Fall has been a whirlwind. I’ve been working 6-7 days a week (happily, might I add) but that doesn’t mean I let my nail art fall by the wayside. Here’s what’s been on my tips this past season. These nails look “sinister-cool”, just like The Little Mermaid’s villain, Ursula. I used Essie’s Chinchilly, which is a neutral plum-grey, for the base. 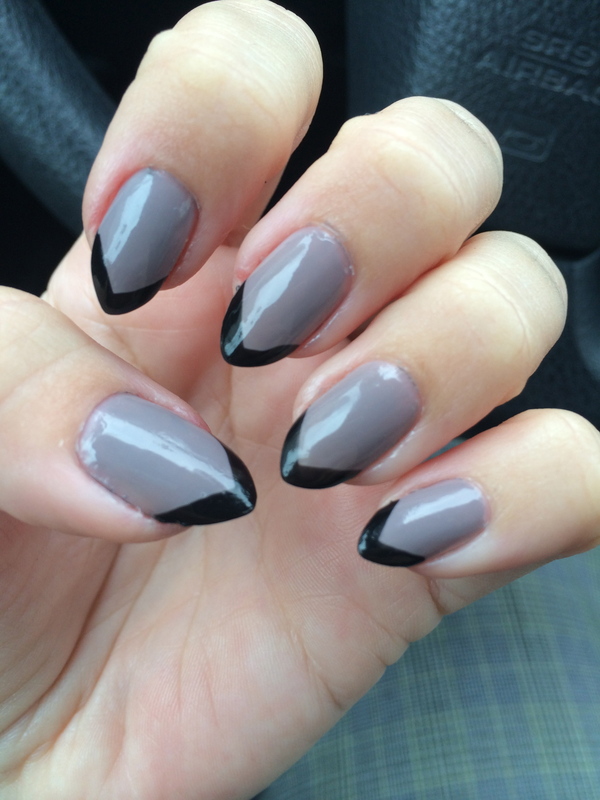 I followed the sharp tips of my nails for the stripes of black. 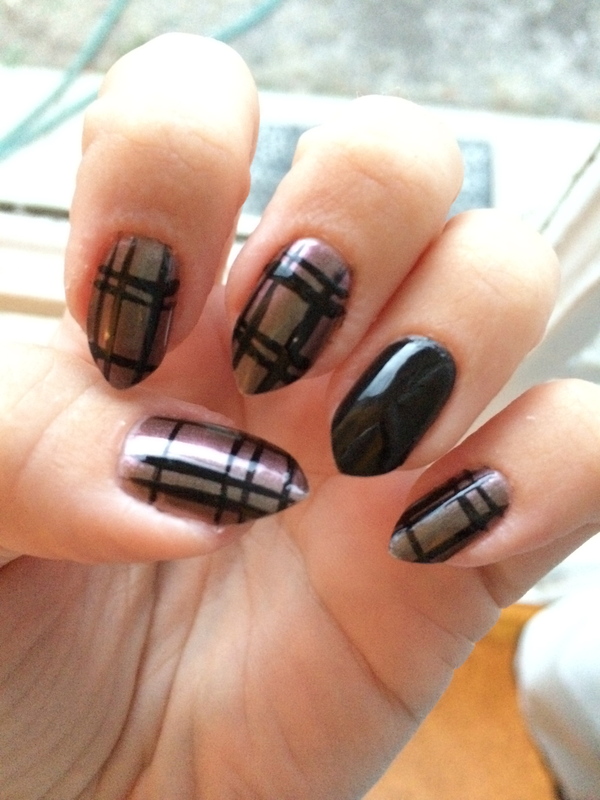 You can also rock this look on square-shaped nails, just line the black polish at an angle for the same effect! If you follow this blog, then you know that I’m a sucker for anything teal. For this look, I rocked a deep dark teal polish on all my nails except for my accent nail, which I chose to paint with Essie’s Mint Candy Apple. I topped off the thumb with Deborah Lippman’s dreamy confection, Across The Universe. The reason this look works is because the polishes I chose are in the same color family, just different shades. You could also recreate this look with purples, reds, oranges, etc. Just keep them all in the same color! These nails pay homage to the concept above, except I did it in purple. 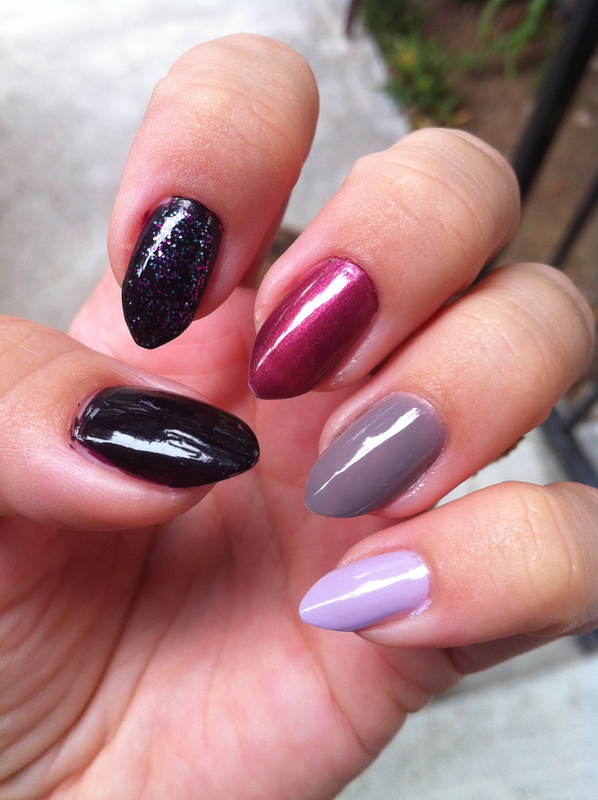 I chose five different shades of purple- eggplant, eggplant-glitter, fuschia, grey-plum and lilac. 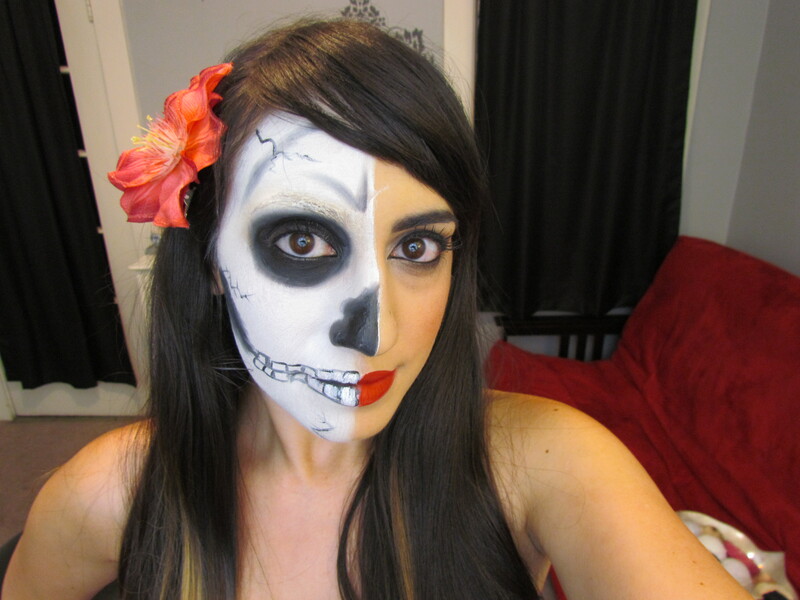 This one’s a repeat design from a look I rocked last fall. I chose a polish with a duo-chrome finish for the base and used a black striper for the stripes. The accent nail in black just makes the whole look sleeker.